This Multifunctional Amazing Car Cup Holder will expand interior space to solve the problem of the seat gap in the items falling. Designed to fit most vehicle, enough space to let you storage with 3 layers, very useful for storing small items. 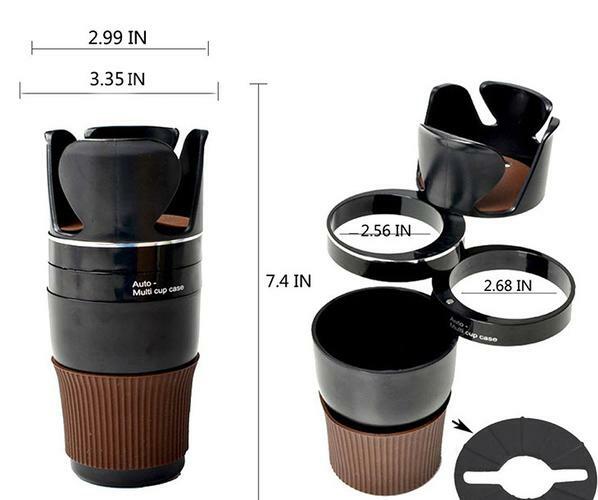 Multi-layers Car Cup Holder, top layer is for phone, sunglasses, pen, 2nd layer holder is for beverages, and the bottom layer is for small stuff such as keys, coins, etc. 360 degree rotation increases more space to hold drinks snacks or others. Keeps necessities within easy reach while driving. Widely compatible with almost all types of car. Silicone cup body cover is perfect to keep your drinks, pen and phone stable during driving.